This is my Guest Post for Kalyani(Mom Chef) of Sizzling Tastebuds. I was so excited and delighted when Kalyani asked me to share a recipe for her guest post series. Thank you Kalyani for me giving such a wonderful opportunity. Its really more exciting to see our own recipe/post on other blog in guest post form. I feel so honored to featured on her space with a special notes. Once again thank you so much. Keeping the festival season in mind I decided to share my family favorite sweet recipe "Vermicelli Paal Payasam". I make this often for all special occasions. Very simple and delicious recipe too. First dry roast cahsew and pista in a pan for a minute and then grind it to a fine coarse powder and keep aside. Heat ghee/oil and cashew nuts, chopped coconut pieces and roast till golden brown and transfer to a plate and add raisins and roast and transfer to the same plate and keep aside. Now to the same pan add 1/2 cup of vermicelli till golden brown and keep aside. Add 4 cups of milk in a nonstick/heavy bottomed vessel and bring to boil. Once it starts boiling add roasted vermicelli and stir well. Saffron or color powder can be added at this stage. Allow to cook for 3-4 minutes, vermicelli should not get cooked completely 3/4th or little more is enough. If you cook vermicelli completely then your payasam will be sticky and turn to kanji. After that add sugar and stir well, cook till sugar dissolves completely and raw smell leaves. Then add cardamom powder mix and add ground nuts powder(if using) and stir well. Again bring to boil in medium heat once starts boiling then remove from the stove and keep aside. Lastly add add roasted nuts, coconut & raisins. That's it...Delicious and Yummy Vermicelli Paal Payasam is ready to serve. Serve hot or chilled. Both taste awesome with some Hot vadas. In the updated pic, the payasam was made without using the roasted nuts powder & added roasted coconut pieces for garnishing. If ur payasam thickens then add milk and adjust to desired consistency. If u feel ur payasam to be thin then add nuts powder or milk powder to get rich and creamy payasam. Labels: Diwali Sweets n Savories, Festival Recipes, guest post, indian dessert/Payasam, milk, vermicelli. Paal Payasam looks absolutely rich,delicious and irresistible..
loved your spring onion chutney.. i have to try it for sure! vada nd payasam..never tried this combo...sounds interesting..
never tried this combo..sounds interesting..
Just saw your post on Kalyani's space...Nice post..Hey this Vada dipped in Payasam is a new combination of eating. Looks great. Payasam is tempting! my favourite dessert.. looks yummy.. I love this payasam,eating with vada sounds yumm. 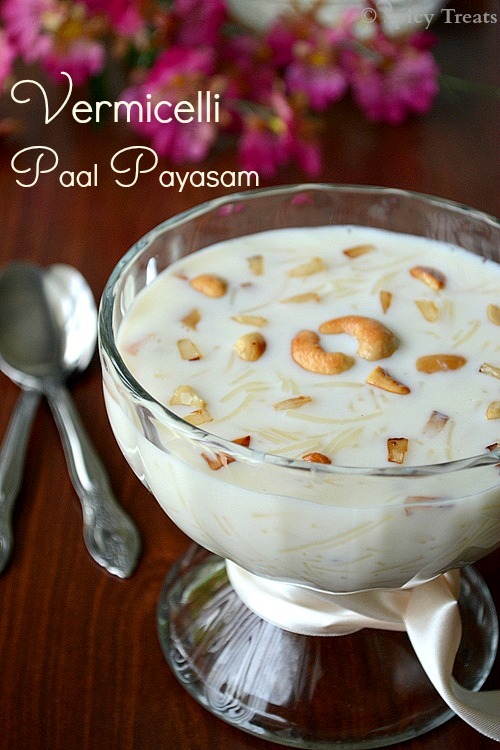 payasam looks absolutely delicious n yummy ! 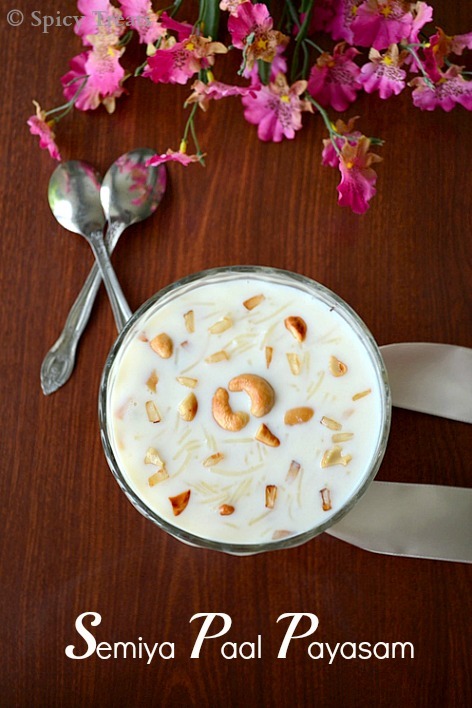 Congrats on your guest post...payasam is so delicious..love the clicks..you have a wonderful blog and I'm happy to follow..